Notability allows users to create, edit, and share business plans all in one place. Both beautiful and functional, Notability seamlessly combines three major ways to capture information: handwriting, typing, and recording. It contains a powerful feature set that helps you be more productive, and provides the tools to capture, create, and share information more effectively. There are two ways Box uniquely integrates with Notability. 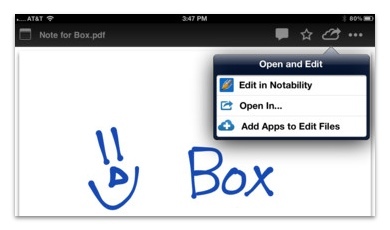 First, you can start notes in Notability and then send them to Box. Simply tap share in Notability, select Box, and pick your destination folder. Furthermore, if you set up auto-sync in Notability, all of your notes will automatically be sent to Box without you having to think about it. Second, you can start notes in Box or edit documents you receive from coworkers. 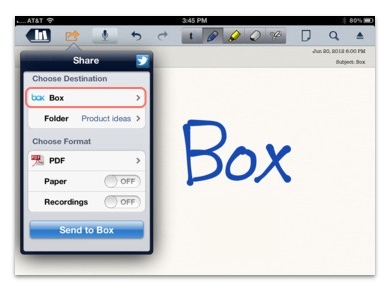 To start a note in Box, tap the cloud in the lower-left-hand corner and select Notability. Then when you're done, tap the Box arrow and your file will be saved to Box. Additionally, if you receive PDFs, RTFs, or Notes from coworkers, these can be opened and edited in Notability. Tap the document to view it in Box, then tap the cloud in the upper-right-hand corner, and select Edit in Notability. Once you're done, tap the Box arrow and you'll be taken right back to Box. If you have SSO, you can log into Box through Notability by entering your email address and leaving the password blank. You will then be redirected to your active directory page where you can login using your company credentials. You can download Notability here and if you experience any issues, you can reach Notability support at support@gingerlabs.com.